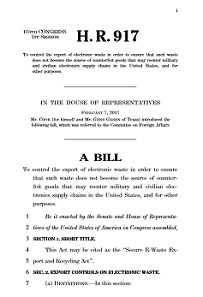 This bill prohibits any person from exporting or reexporting electronic waste (specified items containing electronic components or fragments, including computers, televisions, video display devices, and consumer electronics) or exempted electronic waste items (tested, working used electronics, low-risk counterfeit electronics, or recalled electronics), except as specified. "Low-risk counterfeit electronics" means electronic components or items that: (1) have been subjected to destruction processes that render the items unusable for their original purpose; and (2) are exported as a feedstock, with no additional mechanical or hand separation required, in a reclamation process to render the components or items recycled consistent with the laws of the foreign country performing such process. the exempted items are accompanied by certain required documentation. Commerce may provide exceptions to the requirements of this bill under specified circumstances for exports or reexports of five items or fewer per transaction of electronic components intended for personal use, and of electronic components to a person or entity under the ownership or control of the person exporting or reexporting the components, with the intent that they be used for the purpose for which they were used in the United States. Any violator of this bill or regulations issued under it shall be subject to the same penalties as those applicable to violators of any other provision of the Export Administration Regulations. Counterfeiters often start by stripping used microchips from e-waste – much of it legally exported from the United States. Counterfeiters rely on our exports because the U.S. is the world’s largest producer of e-waste and one of the few countries that allow unrestricted exports of untested, nonworking e-scrap. SEERA combats counterfeiters by requiring domestic recycling of untested, nonworking e-waste. By processing and securing e-scrap here, we will keep it out of the hands of counterfeiters in China and around the world. Amends existing Export Administration Regulations by designating nonworking/ non-tested used electronic items (based on a list of common electronic products or fragments of products that contain circuitry) as “Electronic Waste” which cannot be exported outside of the U.S. unless certain specific conditions are met. Congress needs to act by the end of the year when the current session concludes. Nothing is more persuasive for Congressional offices than hearing from their constituents. Right now it is especially critical that we show support to members of the House Foreign Affairs Committee – your voice can make a difference. Show your support by writing a letter of support to Congress.